13 minutes’ walk from JR Shinjuku Station’s east exit. 3 minutes’ walk from Shinjuku-sanchome Station exit C7 on the Toei Shinjuku Line. 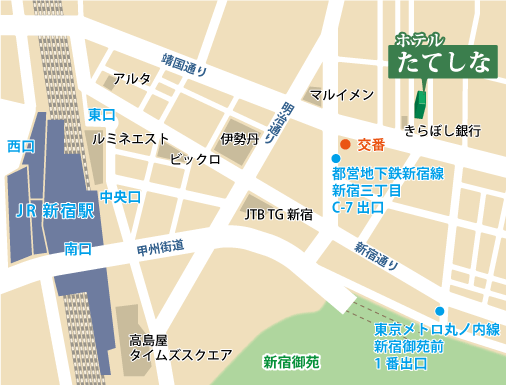 6 minutes’ walk from Shinjuku-sanchome Station exit C7 on the Tokyo Metro Marunouchi Line or Fukutoshin Line. 5 minutes’ walk from Shinjuku Gyoen-mae Station exit 1 on the Tokyo Metro Marunouchi Line. 10 minutes from the Shinjuku Interchange on the Metropolitan Expressway. 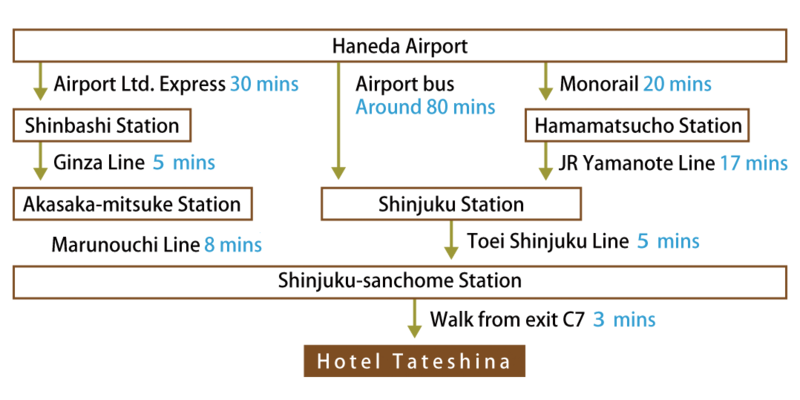 Conveniently located near the Shinjuku sanchome station in Tokyo, Hotel Tateshina is hotspot to meet your satisfaction.